Sabbath at Hands of Hope Academy was a very full day. After picking Eucabeth up in the city and driving the 30 minutes to the school we arrived at 10:30am. The children were already in one of the classrooms singing songs. We joined them and listened to their beautiful music. They have song books in English and have learned lots of songs that I am familiar with. Courtney commented that they have changed a number of the tunes. They have adapted the western hymns and choruses to tunes that suit their style and rhythm. The songs are the better for it! After a few songs, a teacher named Kelvin invited me to come into the adjacent classroom with a group of students. They were the platform party for the church service. We planned who would do which part and then we headed back into the worship room. The church service was a typical one but with extra singing. When it was time for the sermon we explored Luke 15 together. I told them every time God finds one of his lost children, He throws a party. It is so amazing how the three stories of lost things in Luke 15 speak to this culture. Loosing a sheep is a very real danger. One boy told - in the testimony time later - how he had to count the sheep every night and if he did not have them all in the pen he would receive a beating. The next story, the lost coin, is very meaningful to those to whom a 20 shilling coin stands between starvation and their next meal. Losing a coin is a desperate situation - especially in the background of these orphan children. Finally, to an orphan, the story of the lost son - embraced by the father - is a powerful desire in each of their hearts. I assured them their Father in Heaven loves them so very much and when He returns, He will hug each of them. Then there will be an amazing party with the longest table and more food than they have ever seen. We finished with prayer and then sang more songs. 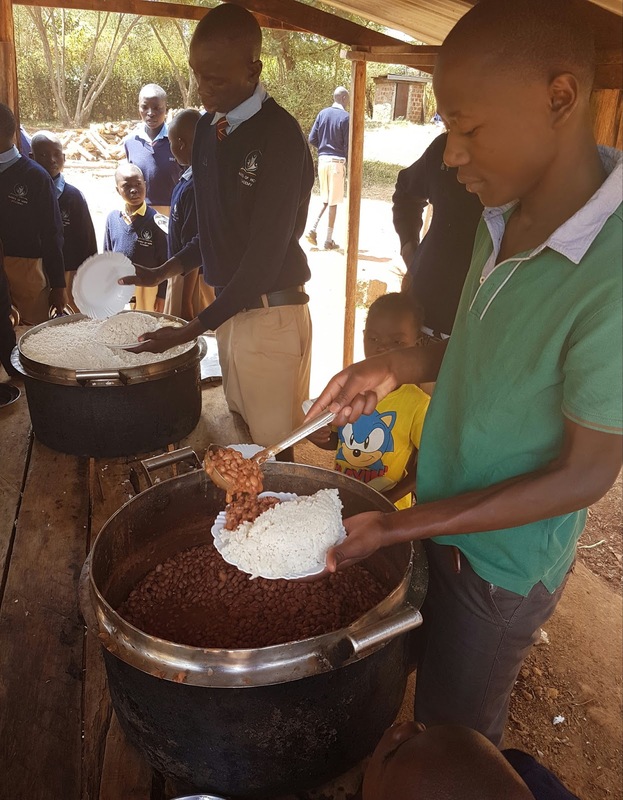 During the afternoon, we had lunch - rice and beans - and a time of testimonies in which a number of the children told their stories. It was a moving time filled with tears of remembering and thanks to the sponsors and school for the lives they have now. Christianity really has skin on it here in Kenya. There are so many people making a difference in the lives of orphans and widows. It’s like the stories of Jesus coming to life all around you. Then it was a game of flipping through photos on my phone and showing it to a circle of kids eagerly waiting to see the next Mzungu teenager. I learned some Swahili as well. I can now point at my nose, teeth, ears and eyes and say the Swahili word for each. Many of the kids speak passable English as they learn it in school. The older the student, the more likely they are to understand most of what I say. When we arrived back from the walk we began making dinner - Ugali and cooked cabbage. One of the teachers cooked soy-meat in a beautiful sauce for the Mzungus. It was delicious. Finally, almost 9pm, we drove back to town, dropped Eucabeth off at her home, drove to the Adventist Guest House and fell into bed exhausted just after 10pm. It was a wonderful day that I will not soon forget.